In the late 1990s, kids kept “Tamagotchi” pets – a digital pet that one “fed” etc, on a device that looked like a pager. For those of you too young to remember, yes, you read that right. Pet…rocks. 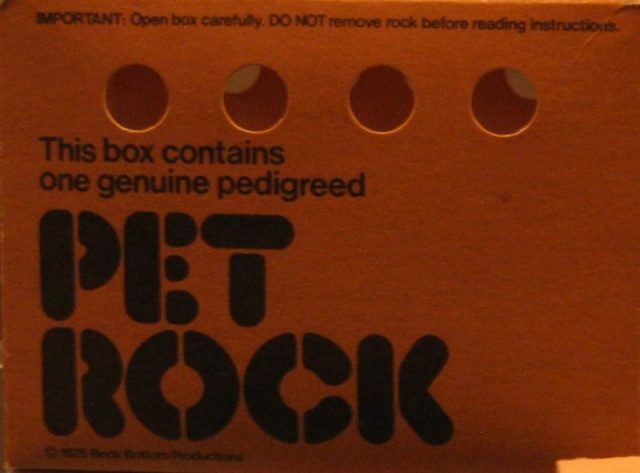 Cover of a Pet Rock box. 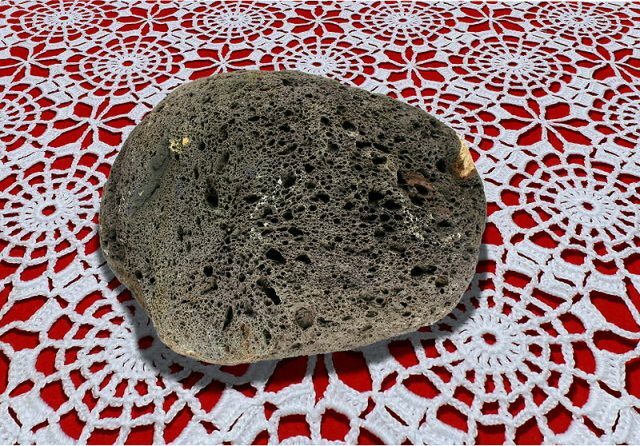 Along with the ubiquitous yellow “Smiley” that gets a nod in Forrest Gump (1994) and “mood rings” which purported to contain a magic stone that changed color depending on your mood, the “Pet Rock” was one of the crazier fads of the decade. Funny thing is, people loved them — and they made their inventor a millionaire. The 70s were a weird decade. Vietnam was over. The mood of the Sixties had turned ugly. Hard drug use was rampant, crime was high, and the economy was stagnant. Making things arguably worse were polyester and disco. It was the perfect time for The Pet Rock. 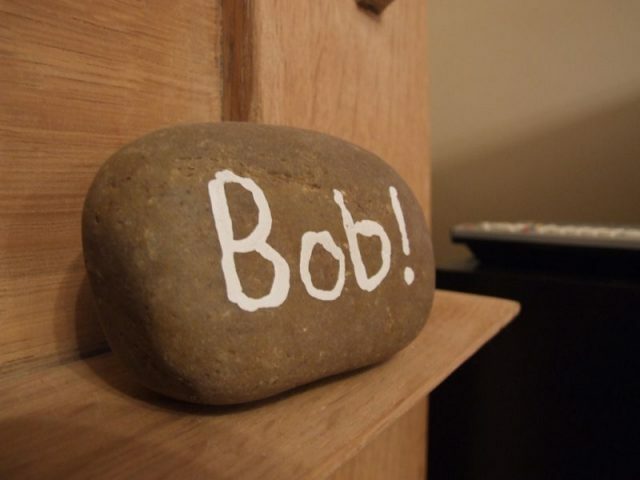 The “Pet Rock” was the idea of Gary Ross Dahl, who passed away in 2015 at the age of 78. One night in 1975, shooting the breeze with friends in a local San Francisco Bay Area (where else?) bar, Dahl and his buddies were throwing out ideas about how to make money quick. Gary had worked as a copy editor for advertising companies and knew, like many in that industry, that just as P.T Barnum had said, “There’s a sucker born every minute.” Adding incentive was the fact that at the time he came up with the idea, Gary was unemployed and needed an income. 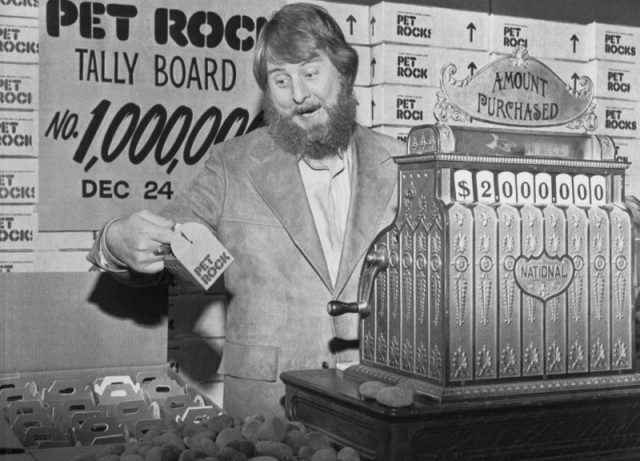 Pet Rock Creator Gary Dahl working behind register. 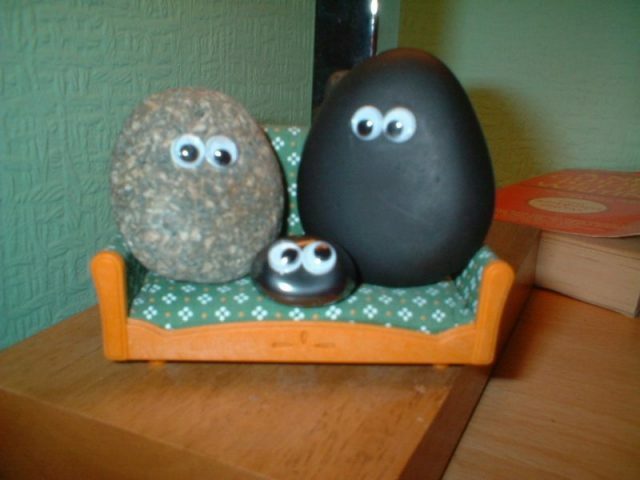 Of course, the Pet Rock wasn’t just a plain old rock. Most of them were round smooth river rocks, but that wasn’t the thing that made them popular. The key was in the packaging. When you bought a Pet Rock, you weren’t so much buying a rock, but buying a series of gimmicks. 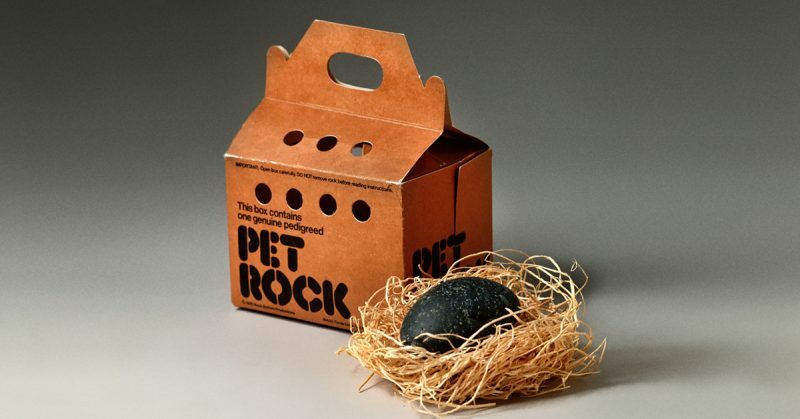 The Pet Rock came in a box resembling the boxes people used to get when they bought gerbils or turtles at the local pet store. It even had air holes for the rock to breathe through, and bits of excelsior to keep it comfortable. Almost as soon as the first rocks had been packaged, they started flying off the shelves of Bay Area novelty and toy stores. Of course, the Pet Rock was a fad. The next year, most of the Pet Rocks sitting on the shelves stayed there. It’s reported that many of the pets were set free and are now back in the wild. As for Dahl, he came up with a couple of similar ideas — “Sand Breeding Kits” and a sort of stoner inspired plan to smuggle mainland China to the U.S. one square inch at a time, called “Red China Dirt.” None of them panned out. However, the money he made from the Pet Rocks did allow Dahl to start his own successful advertising agency, and he retired comfortably, though he tried to remain anonymous – people were always approaching him with what he called “wacko” ideas because his had succeeded. In 2000, he was the winner of the famous Bulwer-Lytton Fiction Contest, awarded for intentionally bad prose.